Among the remarkable architectural monuments of Azerbaijan should be noted Tuba-Shahi Mosque in the village Mardakan. The mosque was built in the XV century and was named after the women who ordered the building of the mosque. 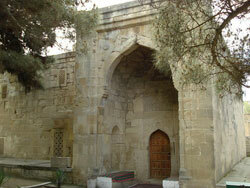 This religious building is well extant and is an example of classical architecture of medieval Azerbaijan. Its facade is decorated with the carved cornice. Portal entrance of the mosque slightly shoves out. It can be called quite unpretentious, since it is devoid of any decoration of wealth. Time of construction of a mosque mentioned and quite well extant in inscription. It contains not only the year of its completion - 886 AH (1481-1482), but also the name of the customer – a certain Tuba-Shahi. Another sign is located at the entrance to a narrow spiral staircase leading to the roof. This inscription obviously belongs to a more ancient mosque of the village and indicates the time of its construction - Muharram 774 AH - 1372 and also the name of the customer - Sadr Haji Baha al-Din, son of Hodge Nur ad-Din, the son of Mahmoud Abay. Expressiveness of the interior of the mosque Tuba-Shahi was achieved with the ideal correlation of volumes.